Enjoy the best of South Florida on this 2-day getaway. Experience a thrilling airboat ride across the beautiful Florida everglades; hop right into all the action in world famous Miami’s South Beach and experience an unbelievable ONE on One dolphin swim! After an early departure from Orlando, arrive at the world famous Florida Everglades. Jump aboard an airboat and travel at speeds up to 30mph across the “river of grass” in search of alligators, turtles and native birds. Afterwards, get a closer view of the local wildlife at an Alligator and Snake handling show where you get the chance to learn, hold, feel, and get your pictures taken with these amazing animals. From there head to Miami’s Bayside shopping area for some retail therapy before arriving at your South Beach Hotel, located in the heart of the Art Deco area, just seconds away from restaurants, shops, museums, night clubs and the beach itself. Once you check into your hotel, you have the rest of the day and evening free to explore the area at leisure. 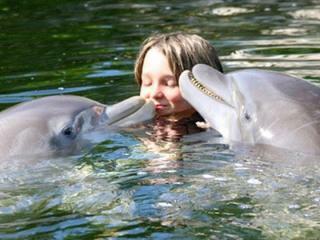 Day two is the highlight of this fantastic excursion because its time for an amazing swim with dolphins! This is your once in a lifetime opportunity for a dolphin swim in the beautiful Florida Keys. During your swim, you can expect foot pushes, dorsal tows, water fights, kisses and handshakes as well as a number of other amazing behaviors. Learn all about the dolphins and what to expect during a 45 minute orientation. The dolphin swim programme includes around 30 minutes in the water with these amazing creatures. For those that chose not to swim, but have family members participating in the dolphin swim are more than welcome to accompany their party to the dolphin facility to observe. If you choose to swim with the dolphins you still have the afternoon in Miami to top off that golden Florida tan before returning to Orlando. Includes: Roundtrip transportation from Orlando, entrance to the Dolphin Plus Facility in Key Largo, 2-hour Swim with Dolphin programme (swim ticket only), airboat ride in the Everglades, visit to a Snake and Alligator Handling Show, visit to Miami's Bayside Shopping area, overnight accommodation in South Beach at the Catalina Hotel (or similar). Prices are based on a minimum of 2 persons travelling. Single passengers are welcome, but a single supplement of £79 is applicable. To book, please call our reservations team. Room Occupancies – rooms accommodate up to four persons. Parties of 4 persons or less will be accommodated in one room. If there are more than 4 persons in your group you will be allocated 2 rooms. If you require an additional room for your party, a £79 per room supplement applies. Please call our reservation if you require an additional room. Baby’s 0-2 years are free of charge, but must sit on a parents’ lap. There is a small charge of $10-15 for a cot, which is payable to the hotel locally. The tour includes pick-up from central meeting points in the International Drive, Lake Buena Vista, Kissimmee and Walt Disney World areas are included. Shuttle pick-up locations generally require a change of vehicle before travelling to the Everglades and Miami.